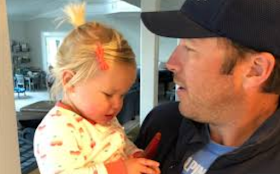 The 19-month-old daughter of former Olympic athlete Bode Miller died after a tragic drowning accident. The Orange County Coroner's Office confirms that Emeline Grier Miller died in a hospital. A source close to the family said Bode and his wife, Morgan, were attending a neighboring party on Sunday and, somehow, Emeline ended up in a pool. It is unclear how long he was in the water but, according to Orange County Fire, the paramedics rushed to the scene and performed CPR before transporting it to a hospital. They were not able to resuscitate her. Morgan and Bode said on social media ... "We are beyond devastated, we never thought in a million years that we would experience a pain like this ... His love, his light, his spirit will never be forgotten ... Our little girl loved life and he lived it to the maximum every day ". Emeline was the youngest of Bode's 4 children. She was named after Bode's grandmother.